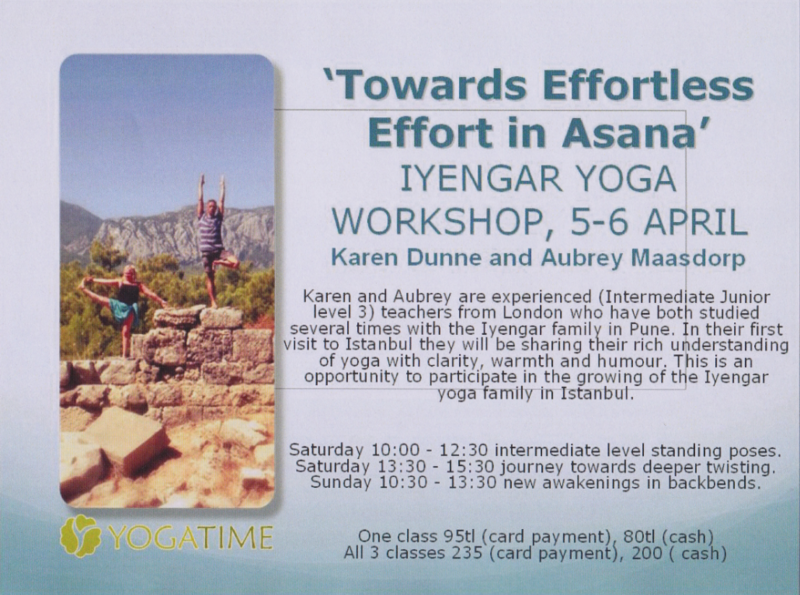 Improve your yoga with this inspiring and strengthening workshop. The hip joints are fundamental to the way we move around. Good function of the hip joint is a powerful tool for saving our backs and knees from the stresses of modern life. This workshop offers a great opportunity for beginners and more experienced students to get the clues for improved hip function. Backbends work to increase the flexibility of the spine. They also help to stimulate positive emotions. This session will be a wonderful way to bring these qualities for an uplifting Sunday morning. Today would have been Guruji’s 97th Birthday were he still alive and today we humbly pay homage to the great Guru and master. 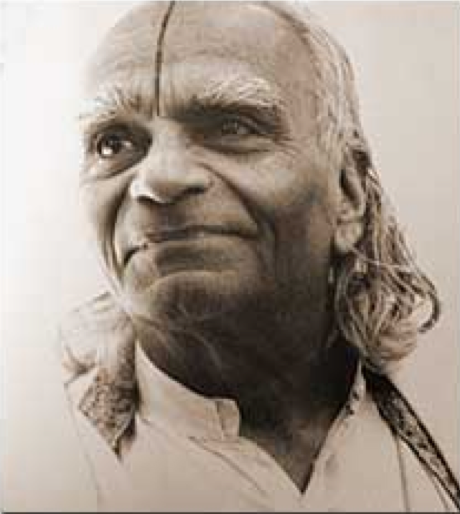 Iyengar’s imprint on contemporary yoga is unparalleled and his 80 plus years of unceasing work have given countless millions of people a taste of the nectar of yoga. Karen & Aubrey return to Istanbul! 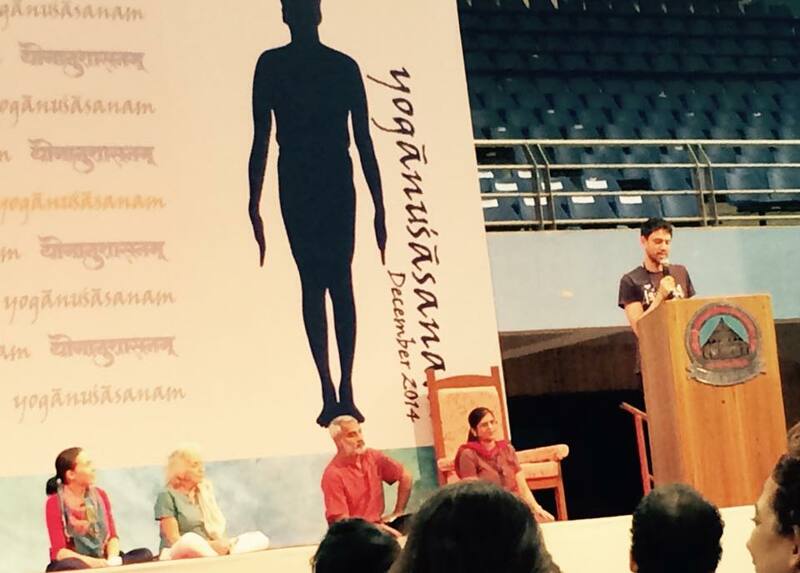 I just returned from ‘Yoganusasanam’, Geeta Iyengar’s 70th birthday celebration intensive course. 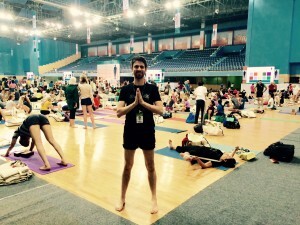 Held in an enormous badminton arena on the outskirts of Pune, this event had over 1200 participants from 57 countries. The course lasted 10 days and in this time Geetaji gave us a firm foundation in basic Asanas in order to prepare for Pranayama which we spent more time on as the event progressed. The title of the event is the first of Patanjali’s yoga sutras and translates as ‘Here begins a detailed exposition of the sacred art of yoga’. There was a rich involvement of yoga philosophy throughout the thoroughly practical course. 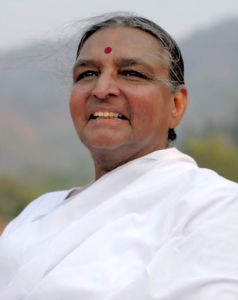 Coming as this event did so soon after the passing of Guruji BKS Iyengar, there were many moving references to the great man and his work as well as special tributes to him from his Granddaughter Abhijata and Geeta. Several things stood out, I had been wondering how this many people would be able to all participate meaningfully together in one event but actually, due to the remarkably intelligent and responsive nature of the organising team, it felt like we were all joined together in exploring some of the important aspects of yoga. But the real force behind the success of the event was Geetaji herself – she was in inspired form and with her inimitable combination of deep knowledge of the subject, razor sharp perception of the students in front of her, and her compassion and humour, she inspired all of us to work hard and to learn. Rarely have I been somewhere where people were so friendly and smiley, old friendships being rekindled and new ones forged in the breaks between classes and over the delicious Indian lunches served to us. I was asked as a representative of Turkey to speak about Iyengar yoga in Turkey and this formed, along with nine other countries, the basis of an afternoon’s presentation that highlighted the variety of people’s experiences in different parts of the world (yoga being banned by Islamic clerics in Malaysia for example). A heartfelt thanks to all who made this wonderful event possible. 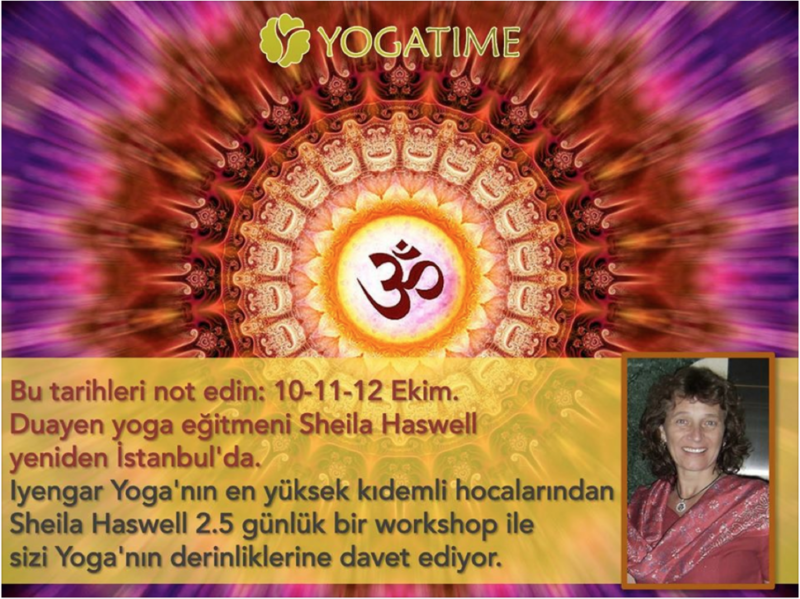 This will be Sheila’s third time in Istanbul, a two and a half day workshop to help deepen your practice. Sheila has over 30 years of teaching experience with a wealth of knowledge to give. Although approachable and humorous she has a determination to encourage students to realise their potential. 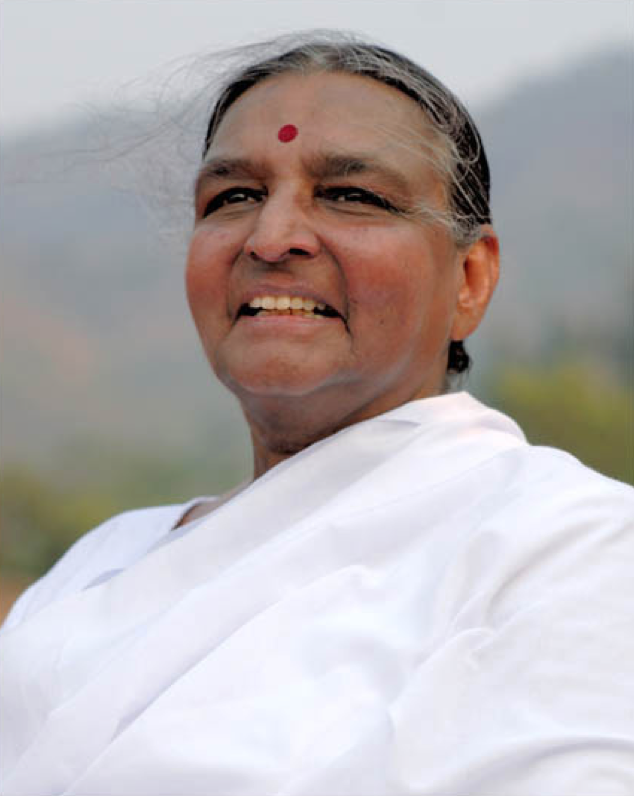 Sheila has worked with the Iyengar family on many occasions. Working with standing asanas to access the potential for simultaneous grace and strength. We lost our teacher, our light on our path and the person who made yoga accessible to the world. His teachings will continue through us and our students. 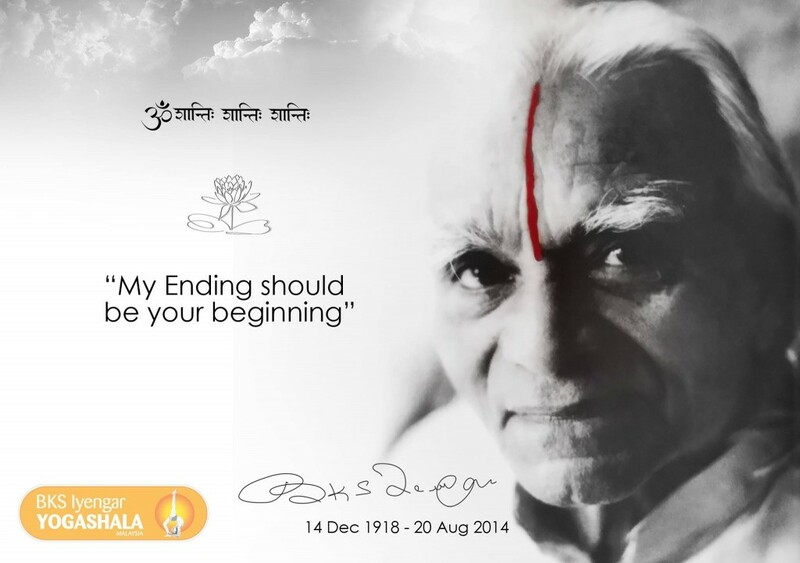 Sleep well Guruji. You can do this asana series early in the morning or in the evening after work to rejuvenate. Practice Ujayi breathing as you perform each asana. Stay as long as you like concentrating on breath and allow the asanas to cool your body and mind. 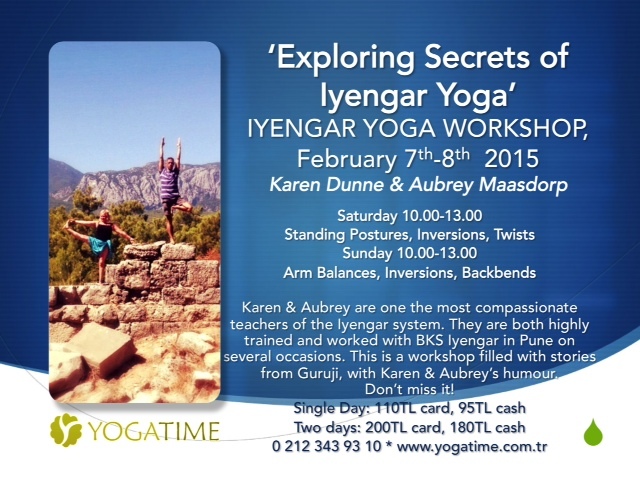 Sine will be teaching at Yogasala Ankara for a two day workshop, 1st and 2nd of February. On the 2nd from 10:30 until 13:00. Come and celebrate on the occasion of B.K.S. Iyengar’s 95th birthday! Iyengar has been inspiring thousands of people all over the world and so on the 14th December at 13:00 we will be getting together to mark this special day. There will be food, drink and chat, and we will watch a film about the origin of modern yoga. Call Sine or Aidan for details.